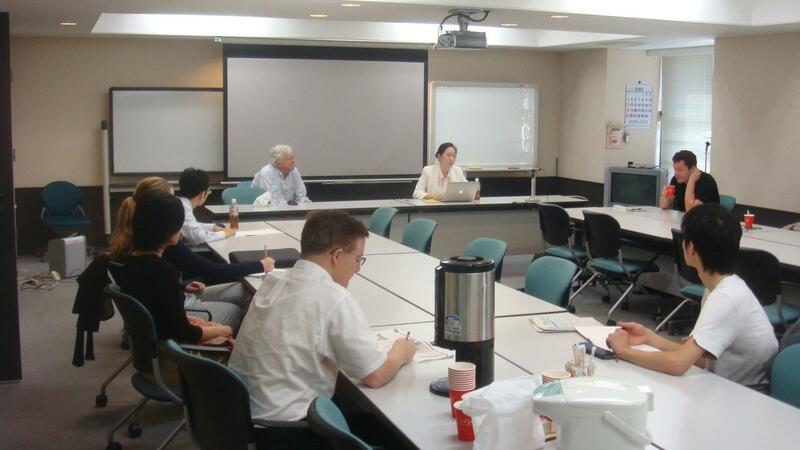 “Overall, whose ox is gored?” is the main question Professor Gregory Noble raised during his comments in the Social Science Dissertation Workshop last week which was held at the Institute of Social Science, the University of Tokyo (we also call it Shaken Seminar). “It all depends on whose ox is being gored” is an old saying of uncertain origin – it may relate to an obscure verse in Exodus in the Holy Bible relating to compensation for the eponymous damaged cattle – but in wide use. It means that a given event will be seen differently depending on the degree to which the viewer’s self-interest is involved. If this phrase that he brought in could be translated to the scope of the main query, it would be whether or not the U.S. takes a trade dispute it to the WTO or not (depending on how much of the dispute is worth in terms of political and economic cost). I think this adage should be given serious consideration as the motto for the main query at stake in this chapter of my current dissertation research. 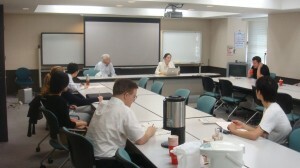 The Shaken seminar is a monthly academic meeting at Shaken organized and hosted by Professor John C. Campbell, and the ground rules are to not use visual presentation tools. The way about doing this presentation would be two-fold; one would be to tell a verbal story about the substantial issues about trade and how they can be resolved, followed by my findings from real life. The context would be broader that my dissertation, or chapter. The other would be to explain the analytical (or even methodological) challenges I faced in working on this project and how you dealt with them–but again, the story of that rather than estimates of coefficients etc, my actual findings. I delivered a verbal presentation of my second chapter, ‘Resorting to International Institutions to Resolve Trade Imbalances? U.S. Protectionism via GATT/WTO Dispute Initiation’. The paper is the first of the three chunks of the main three chapters which are the crux of the dissertation, which is titled, ‘Unraveling the U.S. Trade Deficit Challenge in China, Japan, and Korea: Bilateral Trade Imbalances, Protectionism, and Currency Wars’. Luckily, we had quite a nice group of audience, and the comments that ensued following the verbal presentation of my 2nd chapter prompted me to think twice and more in-depth regarding my content of research. While the modeling and analysis of statistical results are targeting a large-N analysis, the bilateral trade relations that interest me are U.S.-China, U.S.-Japan, and U.S.-Korea; in other words, U.S.-Northeast Asian trade. And this is where the qualitative methodology part comes in. Because this is a cross-country analysis (and also a global analysis in terms of statistical analysis) of U.S. foreign economic policy imposed on three Northeast Asian states, fieldwork and the control of language is crucial in terms of investigating the perceptions of the policy of dispute initiation and the responses from the respective three states. Both the quantitative and the qualitative portions of the research bring in contributions to the IPE literature – in simple terms, the cross-country research brings in the best contribution to the previous work on trade imbalances. regarding the U.S.-China trade disputes and economic conflict ensuing China’s entry to the WTO, much of the issues on trade imbalances have been largely politicized in the policy spectrum (much of all this has been ‘China-bashing’ stories, and this also means that academic investigation in political economy is lacking) but never in a regional spectrum with the consideration of time-lags. Regarding the U.S.-Japan trade imbalances and conflicts, a huge literature on the economic conflicts of the 1970s and the Japanese engagement in WTO trade disputes exists (much of these works are by renowned authors including T.J. Pempel, Edward Lincoln, my on-site adviser Iida Keisuke, and Saadia Pekkanen, as of late), but a current assessment in comparison with the U.S.-China trade imbalances and WTO dispute settlements (as participation in international institutions) for is timely and necessary. The U.S.-Korea story adds much more value (though some may not even care), as Korea is a volatile economy which had been severely vulnerable to the first financial crisis and the current one, but has never been dealt with thorough academic considerations and evaluations despite its history of U.S.-Korea trade imbalances, political pressures, and the Korean won’s fluctuation against the US dollar (in my assumption this scarcity of academic work is owing to lesser policy importance and the smaller size of the Korean economy). The common factors that lie in the U.S.-China, U.S.-Japan, and U.S.-Korea trade conflicts are : trade imbalances accumulation, domestic mobilization of industrial interests, U.S. congressional and presidential politics, bilateral economic pressures (trade aspects and currency appreciation), and finally, U.S. bureaucratic decisions for WTO dispute initiation. Competitive Arguments: Professor Campbell raised an important point on the need to think consciously about competing arguments. Economists may argue that trade imbalances accumulation (and national trade deficit) may not be detrimental to the aspects of gross domestic product and economic growth rate, and even other economic indicators such as unemployment rate. My understanding is that macroeconomists tend not to take trade imbalances (and its size) too seriously as an independent variable. But from an IPE perspective, inevitably there are trade conflicts, political pressures surrounding the agenda, and outcomes resulting from these conflicts which can be traced back to trade imbalances. Comparative disadvantage in trade is always what drives voting behavior in national elections, as long as there seems to be an industrial loss or unemployment due to the trade imbalances. There are some bottom-lines suggested by Professor Campbell: one, if the research question is really on why the U.S. chooses to file certain cases and some cases not, and if the question is really on the decision-making of the USTR, to what extent trade imbalances motivate the US policy decision making, then the conditions regarding the filing of the cases would be central key factors to explain for. Two, differentiating whether it is macro-aggregate trade deficit or sectoral trade deficit would be important. In the latter case, there are specific things you can look into. Given the latter situation, when industry competitions get severe, the likelihood of trade deficit accumulation has always been low. Since the mid-70’s, the U.S. has imported more goods that it has exported. This balance began to improve in the early `90s but has again significantly increased. Some believe the trade deficit is evidence that American companies are failing to compete in global markets or that U.S. exporters face “unfair” trade barriers abroad. Other economists observe that it is the sign of a healthy economy which has the resources to purchase a large volume of goods. In fact, they note that from 1992 to 1997, the U.S. trade deficit almost tripled, while at the same time U.S. industrial production increased by 24 percent and manufacturing output by 27 percent (See Griswold). On methodology: Some question the necessity of combining both quantitative and qualitative methodology in this cross-country analysis. I agree that this may be cumbersome in the process of conducting research, but as much as what is discussed in the dissertation deals with figures, a quantitative analysis is necessary. However, the quantitative (nor the qualitative) portion cannot deliver the wholesome picture here. The qualitative analysis fills up the minuscule details for what the regression results cannot explain for. These are important sources of data analysis that derive from personal government official interviews and policy evaluations, seminars, etc. It is a reflection of how the puzzle is solved in the actual world and not in the world of regressions. Testing Alternative Hypotheses: Painting a big picture and finding research significance. One thing is to always question, ‘What’s the most significant thing here?’ ‘Why does it matter in political economy?’ If I perceive the U.S. as threatening a trading partner with an adjudication signal, the important thing to do would be to paint the big picture in a variety of ranges: placate the interest groups, and pay attention to the hand-waving politics to form alternative hypotheses to answer the puzzle of ‘WHY DOES THE UNITED STATES SUE ITS TRADING PARTNERS IN THE WTO (IF NOT FOR TRADE IMBALANCES)?’ Some could be of the following: one, the United States Trade Representative may be suing because the U.S. is a partner to some of these countries of interest; two, overal trade deficits (in this case, finding cases other than the U.S. would be helpful), and three, presidential policy matters and congressional politics matter in the U.S.
Manufacturing or certain sectoral characteristics that impose competitive disadvantage on the U.S.
Another thing is to look into powerful U.S. multinational corporations, and the dynamics of trade unions vs. companies. The foreign policy guru in Washington may run the U.S. in terms of policy-making, but company interest and voicing of interest may impact politicization. We can start from looking into industry-specific sectors and highlighting them. The more trade deficits accumulation, the more dependent the US economy becomes on the other. The underlying assumption here is that the more the US economy becomes dependent (by sectors respectively), the interests of firms boost the congressional politics in the U.S. to become protectionist. Nonetheless, the scope and query of the research will be confined to investigating government action in the end. This is not about Google, Samsung, Apple suing each other; the dissertation is primarily on government relationships, but on the basis of understanding that there are several other private firms and companies that choose to engage in legal battles. And that’s what fascinates me in this long journey of dissertation research.